Description: Top Quality Industrial Building in Class A condition with Mid-County location. Fully Air conditioned, excellent parking, dock high and grade level loading doors and heavy single and three phase power. Excellent for any type of manufacturing or distribution. 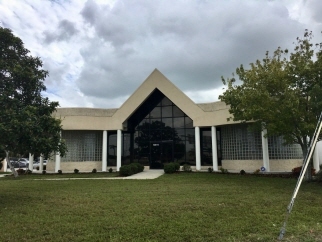 •	10,500± SF building on 5/8 acre of land. •	Entire shop has a drop ceiling with a 10 Ft clear height. There is an additional 3 Ft of clearance above the drop ceiling. •	Heavy power with single and three phase. 1200 amps total. •	One Loading Door with truck well and three grade level loading doors. •	Approximately 2000 of very nice office and showroom space. •	Located on US Hwy 19 N just north of Ulmerton Road. •	Zoning is Light Manufacturing in Largo. •	Insulated Concrete Block Construction. •	1200 amps of single and three phases power.